While each D.A.D.S. 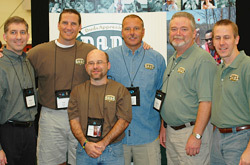 group is independent and develops its own culture and programs, the cornerstone of a D.A.D.S. group is the monthly meeting. Occasional speakers, the "business" of D.A.D.S. and committee reports all take place, but are secondary to the safe forum for sharing, bragging, learning and growing with other fathers who truly understand. Many D.A.D.S. groups host events for their kids and families to spend time together, such as parties, hayrides, fishing and sporting events. D.A.D.S. sponsors new fund-raising opportunities and always harvests a crop of new donors. D.A.D.S. provides the needed "muscle" for DSA events, walks, etc. and uses all events for recruitment. D.A.D.S. uses their own communication vehicles (list-serve, Facebook, etc) for call to action opportunities, meeting and event updates and to keep all members involved, regardless of the frequency of their meeting attendance. D.A.D.S. builds programs, events and opportunities for involvement and ownership for its members, keeping equal respect on the foundational pillars: Support, Fellowship and Action. D.A.D.S. National has many examples and strategies for program implementation.